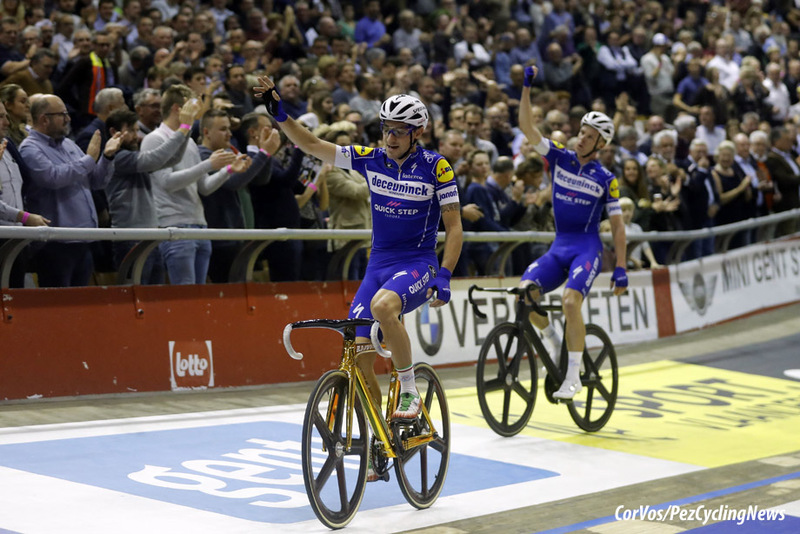 Iljo Keisse and Elia Viviani gave the Deceuninck – Quick-Step team an early first win in the Gent '6 Days' and Mathieu van der Poel keeps winning the cyclocross. All the weekends results plus the Shanghai criterium. 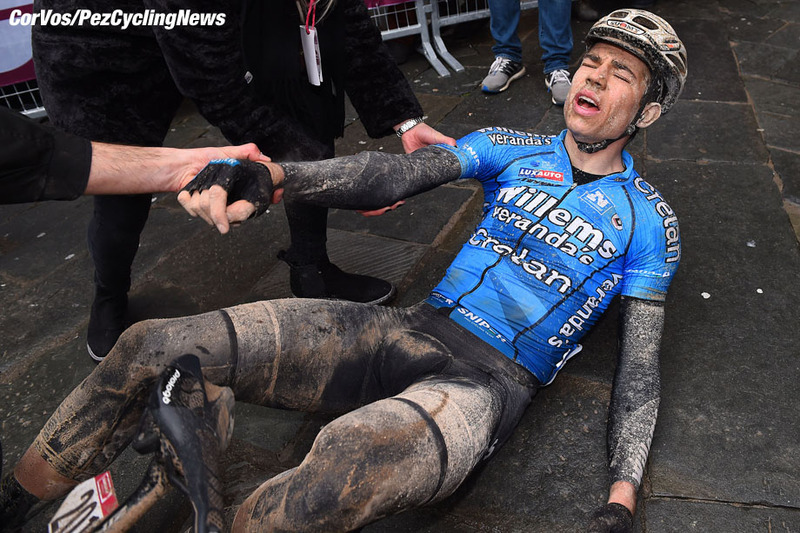 Contract problems for Wout van Aert - Top Story. 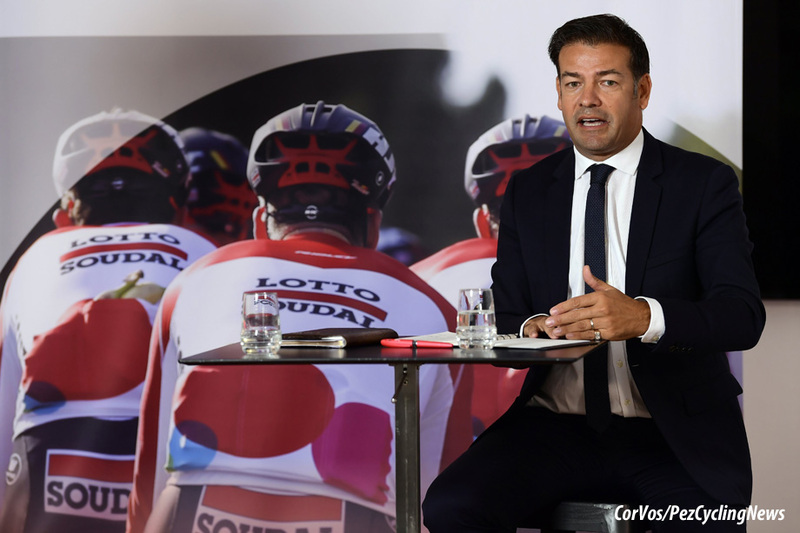 Lotto Soudal manager John Lelangue talks, Julian Alaphilippe to start in South America, Tour of the Alps 2019, Alberto Contador on Dumoulin, 2019 team line ups, new bikes for Roompot, Dimension Data performance department, André Cardoso banned and video from Gent. Monday coffee time! Las Thursday it was announced that Wout van Aert had received the green light from the UCI to negotiate with a new employer with a view to 2019, with the condition that the transfer takes place before 31 December. According to Rudi Desmet, the lawyer of Sniper Cycling, Van Aerts previous team (Vérandas Willems–Crelan): "This is a green light subject to change", he told Sporza. Van Aert broke his contract in September with Sniper Cycling, stating it was due to "compelling reasons". Whether those reasons were compelling enough will be judged in the labour court of Mechelen, but not until the autumn of 2019. Van Aert needed permission from Sniper Cycling to join another team, but did not get that permission, and so his lawyer, Walter Van Steenbrugge, filed a request with the UCI. The UCI announced that Van Aert is free to talk to other teams, but if the court comes to the conclusion that Van Aert broke his contract without good reason, then the UCI has the right to take disciplinary measures against Van Aert and his future team. Although it is not clear exactly what those measures might be. Desmet also warned teams that want to sign the cyclo-cross World champion: "I understand that the UCI will carefully follow the case before the labor court. And more importantly, the green light is subject to change. It states that if it turns out that Van Aert has wrongly broken his contract, the UCI has the right to take further action against all parties. It therefore does seem to me that for interested teams it is not without risk to work with Van Aert." Van Steenbrugge is not impressed by the words of colleague Desmet. "It is a standardized expression that the UCI must use, because there is no judgment yet. They just need a little safety. I do not interpret this as a condition at all. The decision of the UCI is just a precaution." LottoNL-Jumbo has opted for absolute certainty in the case of Wout van Aert. Team manager Richard Plugge does not want to take any risks and wants to see the official documents first. "It is too early to say anything sensible about this," Plugge told Dutch website WielerFlits. "I have heard the news, but that does not change the situation for us for the time being." The team says it will wait for the official documents before being able to act further. Because of the UCI's decision, Van Aert could, in theory, be employed by LottoNL-Jumbo (or another WorldTour team) from 1st January, but the issue that new employers have to take into account is the lawsuit between Van Aert and his now ex-employer Sniper Cycling (Veranda's Willems-Crelan). "There must also be more clarity about liability", says Plugge. Meanwhile the UCI are regulating sock height. 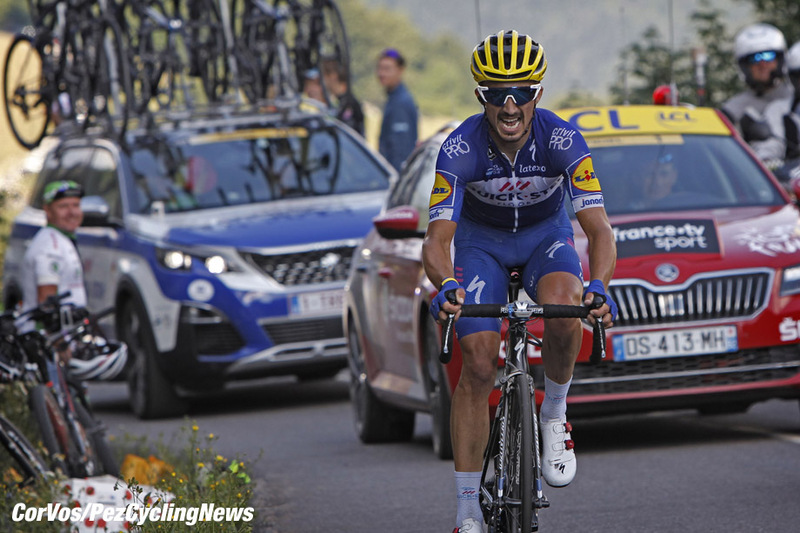 Deceuninck – Quick-Step Team’s mighty performance on the final event of the final day lifted them to first place. A Madison race for the ages, with no dead moments and more action and turnarounds than a Hollywood superhero movie, crowned Iljo Keisse and Elia Viviani – who rode under the Deceuninck – Quick-Step Team banner this week – as winners of the 78th Six Days of Gent, an edition which came down to the wire, with three pairs fighting for the trophy until the last lap. Despite slipping to second overall on the penultimate night, Iljo and Elia’s hopes weren’t deterred by this blow, which motivated them even more on the six day, when they made their appearance in the legendary Kuipke Velodrome. 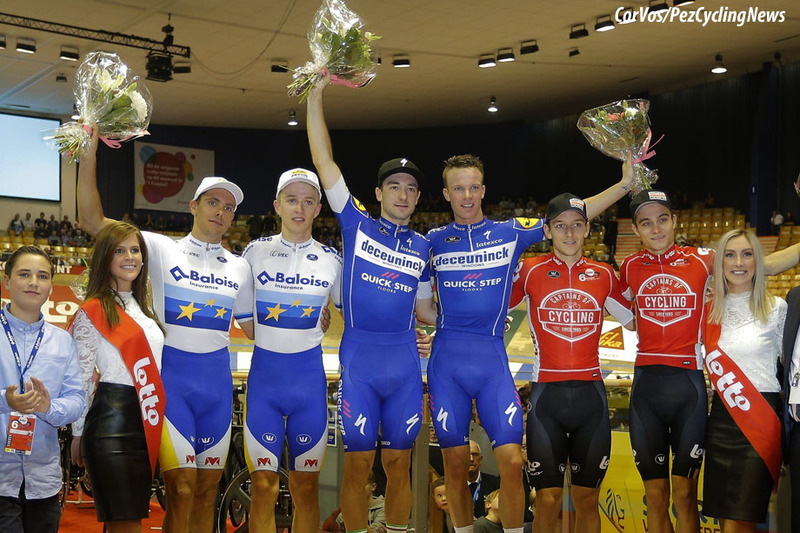 A spectacular victory in the team elimination race brought by Viviani served as a huge boost of confidence for the duo, who leapfrogged their rivals in the general classification. With three races to go, the leaders changed again, but Keisse had something to say about that and powered to an emphatic victory in the scratch, which ensured them a six-point advantage ahead of the final Madison. There, the rival teams tried to put Deceuninck – Quick-Step under pressure, firing attack after attack, but their actions were to no avail, as Iljo and Elia covered every single one of these moves and kept things together until halfway through the race, when Robbe Ghys and Kenny De Ketele finally escaped from their clutches and managed to take a lap. A response from our team came just a few minutes later, prompting a new offensive from their closest opponents, who once again took command of the competition and even looked to be on the verge of going home with the title. 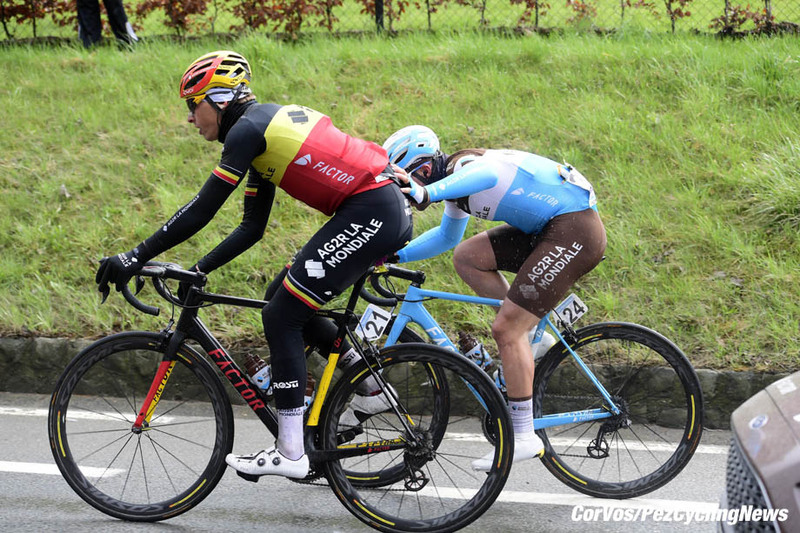 A short armistice followed shortly, before Keisse went like a rocket and gained a lap which put the Deceuninck – Quick-Step Team back in the driving seat. The home favorite and Viviani grabbed as many points as possible at the intermediate sprints, in order to extend their buffer, and tracked down a fresh series of attacks, thus dealing a significant psychological blow to the other teams, who found it impossible to turn things into their favor. Eventually, the race concluded with Iljo and Elia celebrating a hard-fought and memorable triumph, our squad’s 76th of the season, in front of the hundreds of fans who showed their unwavering passion and support throughout the week. "Gent is the most beautiful six-day race in the world! Ask every rider and you’ll get the same response, they all love the public and the incredible atmosphere", said Iljo after his seventh victory in 15 participations. "It’s been three years since my previous win and I was super motivated to get the job done together with the amazing rider that Elia is. We gave everything day after day and to be rewarded with the trophy and the fans’ applause and cheers makes us very happy and proud." For Elia Viviani, Sunday’s victory capped off a truly remarkable year in which he won no less that 18 road races (including seven Grand Tour stages and the National Title) and the European Team Pursuit Championships. "I fell in love with this superb race and the fantastic atmosphere ever since my first participation, a few years ago. This victory, which I’m glad I could claim together with such a six-day racing legend as Iljo, comes after an amazing season for me and it’s something I will always remember", said the first Italian in 18 years to win the Six Days of Gent. 10. Roy Pieters (Ned)-Jesper Mørkøv (Den) – 28 pts at 32 laps. 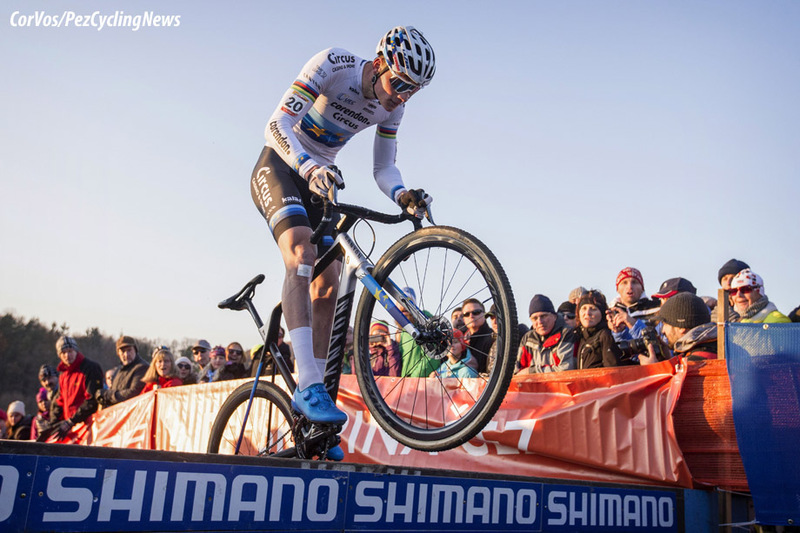 Mathieu van der Poel once again showed his strength on Sunday in the Flandriencross in Hamme. From the very start the European champion had the lead and he did not give it up till the finish. After only one and a half minutes the decision had been made. Van der Poel took Corendon-Circus teammate Tom Meeusen with him for second place. Laurens Sweeck (Pauwels Sauzen-Vastgoedservice) brought in the chase group at 1:50 with Gianni Vermeersch (Steylaerts-777) and Michael Vanthourenhout (Marlux-Bingoal). From the start Mathieu van der Poel took the lead and within one and a half minutes of racing he had a gap. Teammate Tom Meeusen was the only rider to hold his wheel. Behind; Tom Pidcock tried to lead the chase, but he was to pay for it later. Van der Poel dragged Meeusen and after two laps they had 25 seconds. A large group formed behind the Corendon-Circus duo, but they would be racing for third place on the podium. Van der Poel kept the pace high, but he also made sure that Meeusen could follow. With two laps to go, Meeusen had to let Van der Poel go, but he was far enough ahead to take second place. The sprint for third place went to Laurens Sweeck at nearly 2 minutes. Toon Aerts still leads the DVV Trophy overall, but now by only 1:56 over Van der Poel with five races remaining. Race winner, Mathieu Van Der Poel (Corendon-Circus): "I'm a bit tired from my lead. I did not expect to ride that far away on this circuit. If you look at the women's race, it looked like it would stay together for a long time. It is very nice to win so much. I am very happy and think that I am really in my top form. I had a very good day, just like yesterday. I do not think it will even be better, but if it stays that way then I am very satisfied. Certainly one of the best (days). Ruddervoorde also, there I was really good, but today was really nice. Also to get Tom along, that gave extra morale. He had called three times that I had to drive, but I knew I had to take him because there was some wind. Just to sit alone was difficult. Two laps before the end I knew he was going to be able to keep it (second place)." 2nd, Tom Meeusen (Corendon-Circus): "I told Mathieu that I wanted to ride two laps on his wheel, and today he took me. I am very grateful to Mathieu for that. I never thought of the victory. He could have dropped me on four or five places per lap, but he kept looking back and took me away. It is nice to have such a teammate who wants to do something for you. That is nice for the morale. I was like a flag, right? I was hanging on Mathieu as a flag. It is nice to see his rear wheel sometimes." Old champion, Roger De Vlaeminck is not a fan of the Mathieu van der Poel dominance: "I find it very unfortunate what happens. No one comes to Mathieu van der Poel's ankles, he is far too good. I think that Van der Poel should be smarter. After ten minutes you have seen everything in cyclo-cross. It is no longer worth viewing. Van der Poel is a real Dutchman who wants everything. I understand that, but you can also make it beautiful if you are the best, because I do not like it anymore. Van der Poel makes the sport a little bit broken." De Vlaeminck wants to train World champion Wout van Aert to close the gap on Van der Poel. "Maybe it's too late for this year, but next season that can certainly work. 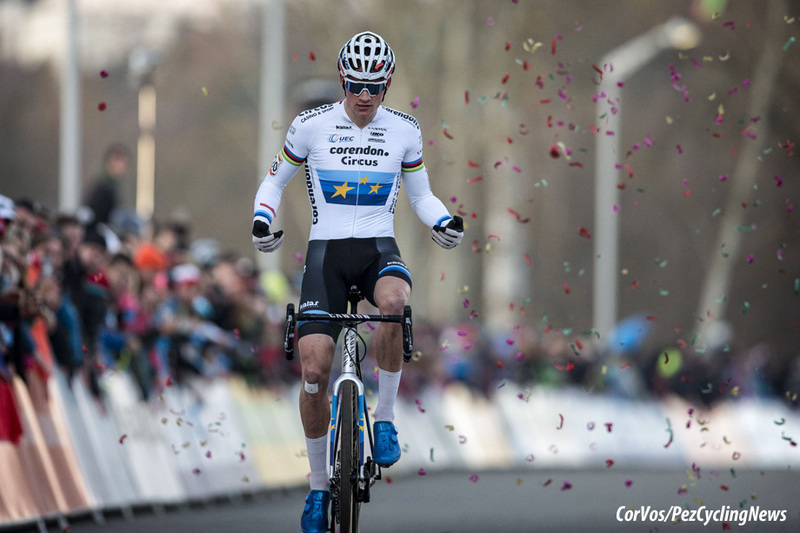 I am sure that Van Aert will return and that Van der Poel will no longer let him go. Although Van Aert must have been freed from those contractual disputes first, because they play a role. I want to do that for sure. I am always for the weak. In my time I was slightly weaker than Eddy Merckx, not a lot, but I always pulled up to him." 10. Jens Adams (Bel) Pauwels Sauzen-Vastgoedservice at 2:06. 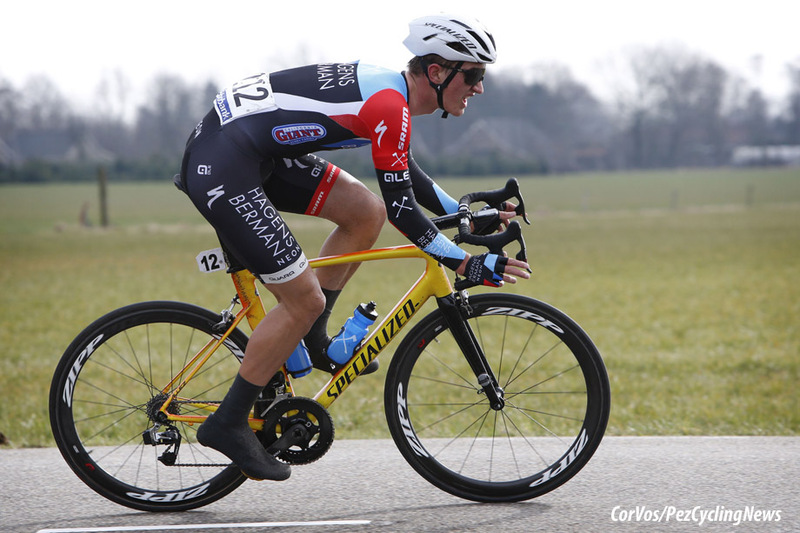 Mathieu van der Poel (Corendon-Circus) ran away with the win in Tábor on Saturday. It only took the 23-year-old Dutchman a quarter of an hour before he put in his move to drop Michael Vanthourenhout (Marlux-Bingoal) and Lars van der Haar (Telenet-Fidea Lions) and solo to his 10th victory of the 2018/19 season. Mathieu van der Poel knows the Tàbor course very well as he won the World championships three years ago and his European title last year. Van der Poel went from the gun today ahead of his two biggest rivals; Wout van Aert (Cibel-Cebon) and Toon Aerts (Telenet-Fidea Lions). When the European champion saw that he didn't make a gap he eased off and allowed World Cup leader Toon Aerts to take over the lead work. At the end of the second lap Van der Poel took the lead again and took a fast line through the corners as Aerts made a mistake. 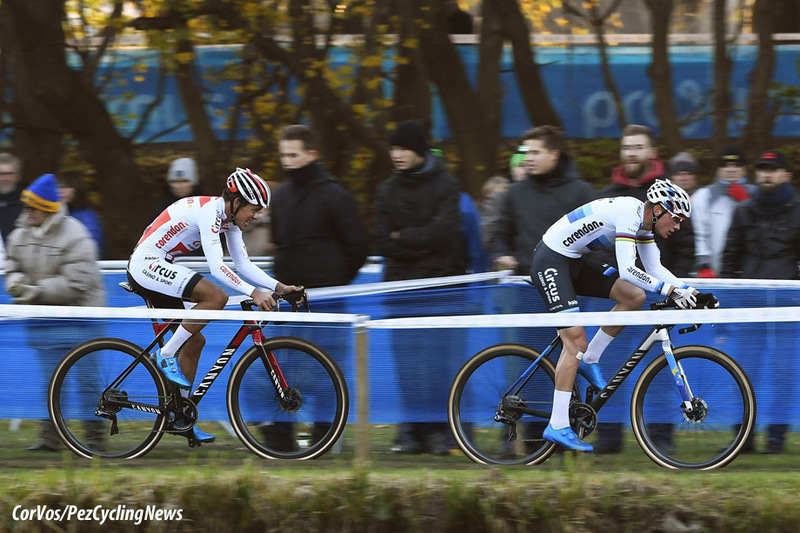 Van der Poel quickly had a lead of 10 seconds, which soon went to 30 seconds, and after 15 minutes of racing the game was over. Behind; Michael Vanthourenhout had a hard battle with Lars van der Haar for the two other places on the podium, but it was on the jumps on the last lap that Vanthourenhout eventually moved into second place and Van der Haar had to be content with 3rd place. World champion Wout van Aert had been with the leaders and looked strong until a puncture on the 4th lap. He continued to race, but didn't make a dent on Van der Poel's lead. World Cup leader Toon Aerts finished 4th and now has a 32 point lead over Van Aert. Race winner, Mathieu van der Poel (Corendon-Circus): "I didn't have the plan to ride away from the start. At a point where they did not expect it, I got a gap, then I could do my thing. I immediately had the right feeling. I started riding at my own pace. That is the easiest for me, then I can just continue to ride my own lines. Tábor is just a course that really suits me. I have never lost an edition here since I was a junior, and I am very proud of that. I like to come here very much, I became World champion for the first time with the elite, so that is special." 2nd, Michael Vanthourenhout (Marlux-Bingoal): "I briefly tried to get back to Mathieu but realized that he was going too fast. I decided to ride at my own pace because otherwise, you blow up your engine. The others weren’t coming closer. I rode the next lap at my maximum and managed to distance them a bit. Due to the barriers, which I love, I was able to get second place. It’s a course I like a lot with a lot of altitude and also some technical sections. On this course I became World champion in the U23 category and narrowly lost out on third place at the European championships last year." 3rd, Lars van der Haar (Telenet-Fidea Lions): "I am very happy with a podium place today. It is a course that suits me very well and if I had ridden away from the other group a little earlier, but it was difficult to make the difference. What else can I say about Mathieu van der Poel? Not much more. He is just very strong and on this course for sure. On the bars he can get a few seconds and I think he is very hard to beat." 10. Daan Soete (Bel) Pauwels Sauzen-Vastgoedservice at 1:12. The Shanghai roller coaster is no place for distractions! This is the golden rule of races on dynamic circuits, particularly when points are up for grabs every four laps. A brave group of six riders, including Romain Bardet, Wang Meiyin, Nils Politt and Daniel Oss, rolled the dice from the start. However, the peloton never conceded more than 20″ and reeled them in on the fifth lap, leaving a five-man group to launch a counter-attack. Marcel Kittel ruled the roost and nabbed the points on offer at the second intermediate sprint, capitalizing on the absence of green jersey Peter Sagan, usually voracious in these sprints. 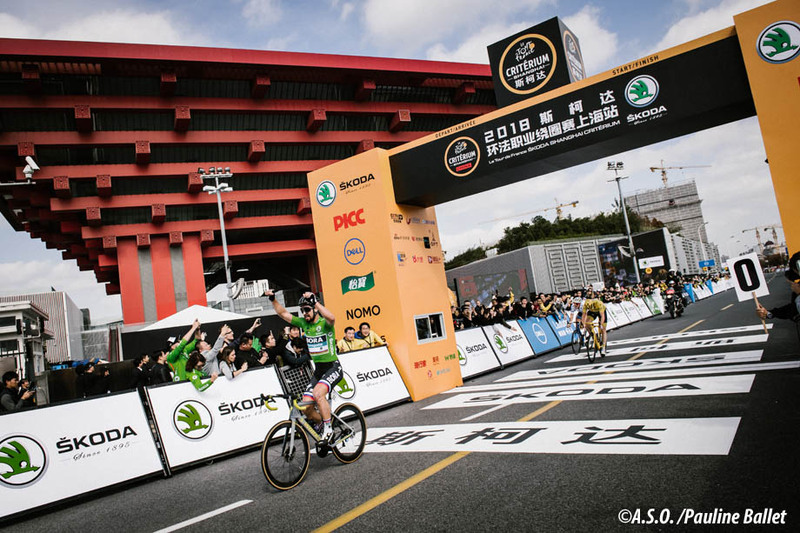 The German sprinter, who went home empty-handed from the Grande Boucle, was eager to make amends in China by taking the points classification, despite Luka Mezgec sticking to his wheel at the third intermediate sprint. Bardet, almost as lively as on the Alpine slopes, surged again from the leading group with a counter-attack that caught the eye of the jury of the combativity prize. It all came back together on lap 16 of 20. A magic square broke away from the peloton with ten kilometers to go, featuring Geraint Thomas, Peter Sagan, Pierre Latour and Matteo Trentin. The yellow jersey kicked it up a notch with just over two laps to go, dropping the white jersey, who found himself in an awkward position between the front of the race and the fast-chasing peloton. A three-way sprint started to take shape on the final lap. The European champion had an ace up his sleeve, but Peter Sagan pre-empted him to accelerate with over 300 meters to go and let his sheer power do the talking. They should not have tickled the dragon's tail! He may not be as lean as he once was, but the Luxemburger's smile and bright eyes have not changed a bit since he won the 2010 Tour de France. Andy Schleck hung up his bicycle a while ago, but he still visits the peloton regularly as an ambassador for Škoda, which asked him to be its public face at the event in China: "I know the country well, I come here quite often and you can see how fast cycling is growing here. I went for a ride with over 2,000 amateurs this morning. This place has loads of potential." Watching the Criterium from the sidelines, Schleck also took the opportunity to take in the scent of competition without the usual pressure: "These boys were my colleagues not so long ago, and many of them are still good friends. It's always a pleasure to be here, I feel at home." 3. Matteo Trentin (Ita) Dimension Data. On Thursday 15 November, John Lelangue officially started as Lotto Soudal’s new General Manager. By means of introduction the 48-year-old Belgian shares his vision for the first time. Once he has got to know every team member, his idea of how he wants to manage the Lotto Soudal team will become more and more clear. In the first place John Lelangue emphasizes four important pillars. John Lelangue: "First there are the sporting aspects which are already and will obviously remain the heart of the team. I have never worked together with Marc Sergeant before, but we have known each other already for several years. I am thus very satisfied I can work together with such a personality with an impressive record. It goes without saying that Marc will be the one who takes the sportive decisions. Of course, we will consult with each other but within Lotto Soudal Marc is best placed to decide on that topic . Marc has a team of directors sportive around him who each have their own responsibilities. In addition, Kevin De Weert will join that team. As a performance manager, he will have some specific tasks. With his background, he will certainly be a major asset to Lotto Soudal." "The structural and organizational aspect is the second pillar. There is obviously already a solid structure within Lotto Soudal since it is an organization that has been competing at WorldTour level for several years now. But I want, together with all the people within Lotto Soudal, to strive to take a closer look at each aspect of the team (training, medical supervision, nutrition, material…). In that way we can determine where there is still margin for improvement with the existing resources. In that sense we can, obviously through dialogue, optimize the structure." "A third pillar is the hallmark of Lotto Soudal, namely the Belgian identity. This does not only concern the WorldTour team, who is to the outside world mostly in the spotlight, but also the U23 team and the ladies team. Half of the Belgian cyclists within the Lotto Soudal line-up have been trained via the U23 team. Women’s cycling is also booming. Therefore, we will continue to commit to those two entities in the years to come. Our team already exists for 35 years and after all Belgium is the cradle of cycling. For me it marks a return to Belgium after some foreign adventures. But if the main Belgian WorldTour team asks you to become their General Manager, you are certainly flattered." "The last pillar is the already very strong relationship with the partners. But also, in this field we want to check how we can unite and promote the interests in both sporting and commercial terms to their maximum. Our sponsors have already expressed their long-time commitment. At the time, Soudal signed an agreement for six years, Lotto has been participating for dozens of years in the sport and Ridley has also been connected to the team for quite a while. We therefore must examine how we can consolidate these partnerships and how we can attract new partners. In current cycling it is not obvious to find new budgets but with our specific characteristics I am convinced that we will succeed to make progress in that area too." The future of Tom Boonen on the technical staff of Lotto-Soudal is still uncertain. The 2005 world champion held an advisory role with the WorldTour team last season. "I don't think he has a contract for 2019," John Lelangue said to Het Laatste Nieuws. "I will not make any further statements about Tom Boonen, I will first analyze that situation." The 26-year-old Frenchman will debut at Vuelta a San Juan, before making his second appearance at Tour Colombia. "Last season was truly memorable, but that’s history now and the only thing that matters is what next year will bring in terms of results. I’m very motivated to keep the ball rolling, add to the results I have enjoyed together with this fantastic team and show what I’m capable of, as I’m confident I haven’t reached my limits yet." "Starting early, in Argentina – a country of which I’ve heard only great things from Max Richeze – and then in Colombia, where I took my first win in 2018, will give me the chance to find my legs right away after the off-season and lay the foundation for what I hope to be another beautiful and memorable year", said Julian, who next month will attend Quick-Step Floors’ first training camp in Calpe. The GS Alto Garda’s Euro-regional race will present the 2019 and main novelties at the Sala Buzzati in downtown Milan. 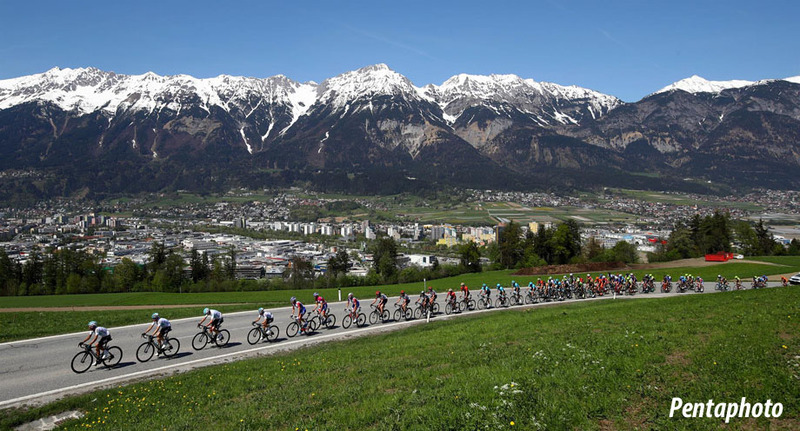 Following the race’s success among its protagonists and stakeholders, as well as the remarkable media exposure (20 hours of live broadcast, reaching a 150-million audience) that significantly contributed to the promotion of the Euregio territories - Tyrol, Südtirol and Trentino - the Tour of the Alps’ organizing committee is now focused on a new edition (April 22nd-26th, 2019), confirming its five-stage program. The 2019 #TotA route will be unveiled to authorities, Italian and International media at the Sala Buzzati (via Balzan, 3) in Milan (Northern Italy), on Wednesday, November 21st at 11.30 am CET. The race philosophy and format will not change: the stages will be characterized by fairly short but technical and demanding routes, crossing the stunning landscapes of the Tyrol-Südtirol-Trentino Euro-region. 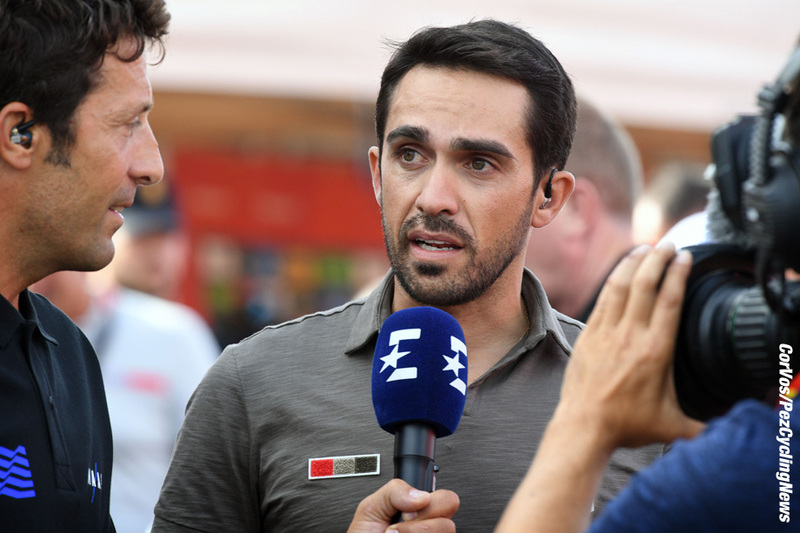 Contador: "Dumoulin will Win a Grand Tour in 2019"
Alberto Contador has said he thinks Tom Dumoulin will win a Grand Tour in 2019 in an interview with the Spanish sports paper Marca. However, El Pistolero is also critical of the Sunweb team leader. The Spaniard watched the sport as an ex-rider for the first time in 2018. "We have seen a small generation change. Froome has won the Giro, but in Italy we saw young riders like Miguel Ángel López and Richard Carapaz compete for the classification. Dumoulin has done very well in the Giro and the Tour. It seemed that he had the final victory, but in the end he did not do well tactically." Geraint Thomas dominated in the Tour. "It was clear that Sky was a favorite and the Welshman was impeccable. He made no mistakes and that enabled him to win," but Contador does not expect Thomas to win the Tour again next season. "I think he will choose the Giro in 2019, even if he could win the Tour again. When Bernal goes to the Tour in perfect conditions, he is my favorite." He sees Dumoulin as a big contender to win a Grand Tour in 2019. "We still do not know who will start where, but I put my money on Dumoulin, Bernal, 'Superman' Lopez and/or Froome", predicts Contador. Mitchelton-Scott has completed its team for 2019. The Australian formation starts the new season with 26 riders. In 2019 the Australian WorldTour team welcomes seven new riders: Brent Bookwalter and Callum Scotson from BMC and Tsgabu Grmay from Trek-Segafredo, plus Edoardo Affini (SEG Racing), Nick Schultz (Caja Rural-Seguros RGA) and Dion Smith (Wanty-Groupe Gobert). Robert Stannard moved from the feeder team last month. Mathew Hayman says goodbye in January after the Tour Down Under. 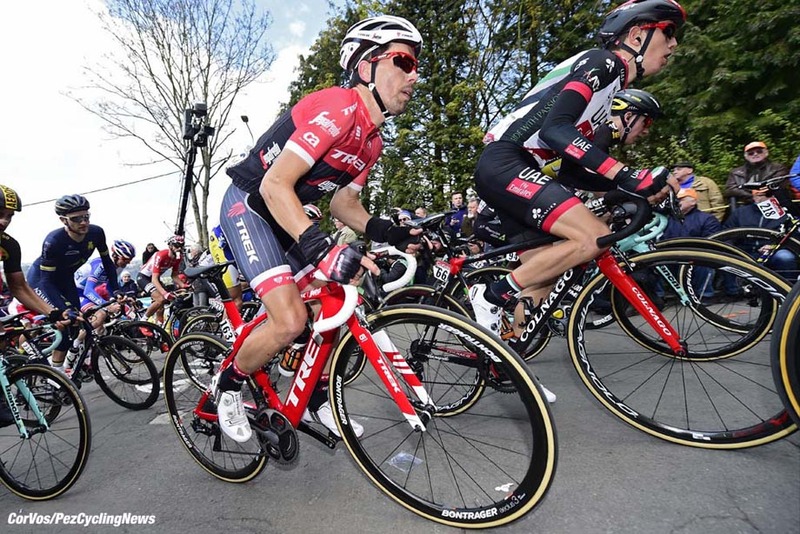 Six riders leave: Caleb Ewan and Roger Kluge move to Lotto Soudal, Roman Kreuziger to Dimension Data, Robert Power to Sunweb, Svein Tuft to Rally Cycling and Carlos Verona to Movistar. In the Grand Tours Mitchelton-Scott will rely on Vuelta winner Simon Yates, his twin brother Adam and the Colombian Esteban Chaves. "We want to continue our success in the big rounds and continue to support our classification riders in the battle for the overall victory", explains team manager Matt White. "But the classics are still a spearhead for us. We have a Flemish and Ardennes group that are able to win there. That is still an important goal for the team." Edoardo Affini (It), Michael Albasini (Swi), Jack Bauer (NZ), Sam Bewley (NZ), Brent Bookwalter (US), Esteban Chaves (Col), Luke Durbridge (Aus), Alex Edmondson (Aus), Tsgabu Grmay (Ert), Jack Haig (Aus), Lucas Hamilton (Aus), Mathew Hayman (Aus) until January 20, Michael Hepburn (Aus), Damien Howson (Aus), Daryl Impey (SA), Chris Juul-Jensen (Den), Cameron Meyer (Aus), Luka Mezgec (Slov), Mikel Nieve (Spa), Nick Schultz (Aus), Callum Scotson (Aus), Dion Smith (NZ), Robert Stannard (Aus), Matteo Trentin (Ita), Adam Yates (GB), Simon Yates (GB). Groupama-FDJ has confirmed its team for 2019. 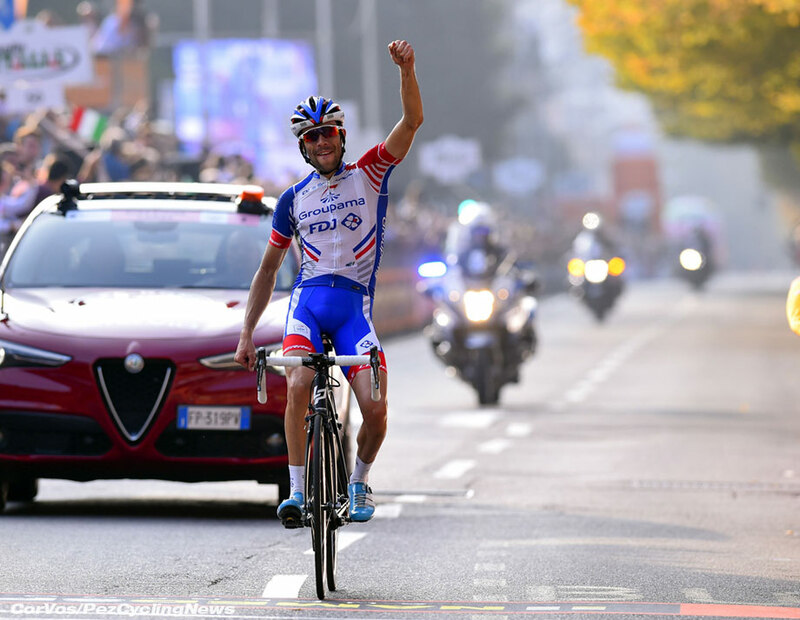 The WorldTour team of Arnaud Démare and Thibaut Pinot has 28 riders for the coming season. The team lost three riders from this season: Davide Cimolai to Israel Cycling Academy and Arthur Vichot to Vital Concept-B & B Hotels. Jérémy Roy has retired. Stefan Küng, Kilian Frankiny and Miles Scotson have all come from BMC. Bruno Armirail (Fra), William Bonnet (Fra), Mickaël Delage (Fra), Arnaud Démare (Fra), Antoine Duchesne (Can), Kilian Frankiny (Swi), David Gaudu (Fra), Jacopo Guarnieri (Ita), Daniel Hoelgaard (Nor), Ignatas Konovalovas (Lit), Stefan Küng (Swi), Matthieu Ladagnous (Fra), Olivier Le Gac (Fra), Tobias Ludvigsson (Swe), Valentin Madouas (Fra), Rudy Molard (Fra), Steve Morabito (Swi), Thibaut Pinot (Fra), Georg Preidler (Aut), Sébastien Reichenbach (Swi), Anthony Roux (Fra), Marc Sarreau (Fra), Miles Scotson (Aus), Romain Seigle (Fra), Ramon Sinkeldam (Ned), Benjamin Thomas (Fra), Benoît Vaugrenard (Fra), Léo Vincent (Fra). 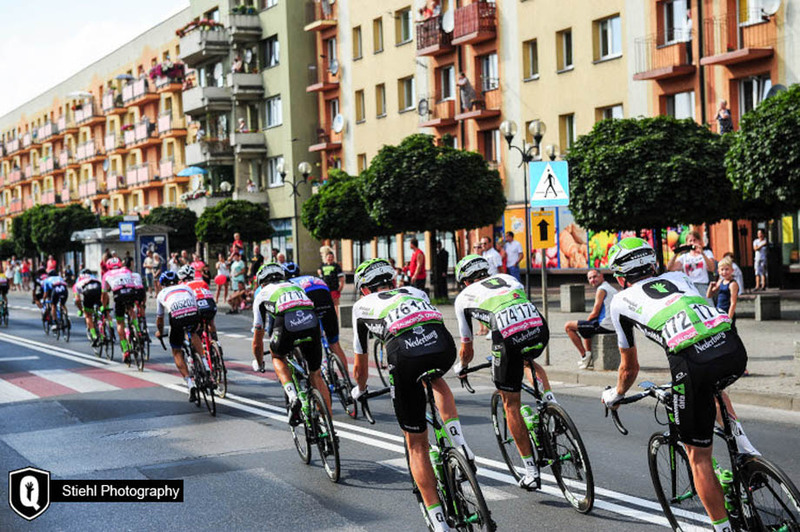 A world and European champion will be part of Caja Rural - Seguros RGA next year. 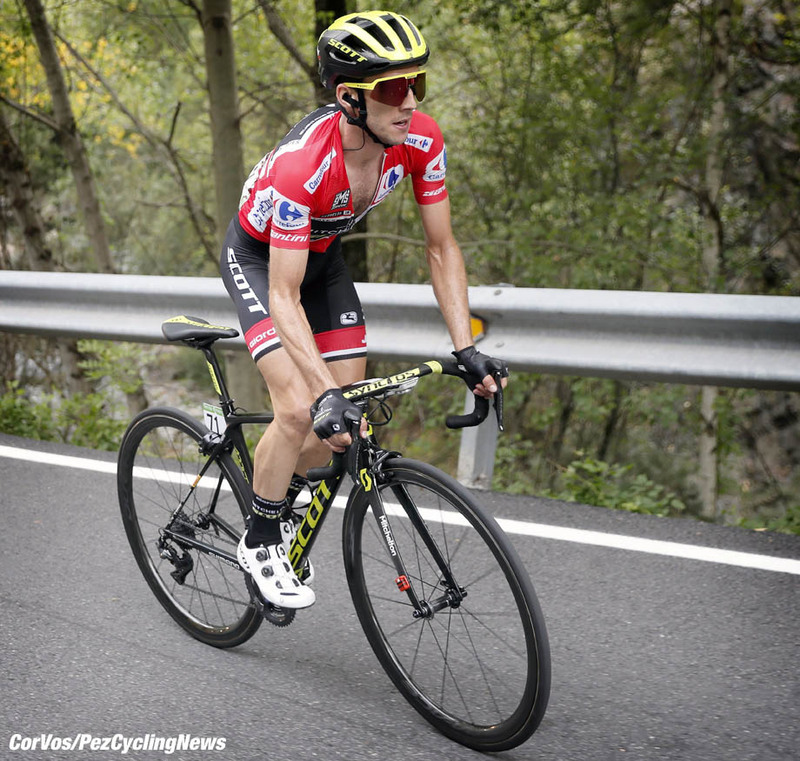 The Castellón-born Sebastián Mora (Villarreal, 1988) will have his first opportunity in the Professional-Continental category after showing his potential on the track, where he was proclaimed world champion of scratch in London 2016. In addition, he was also European champion of this discipline in 2015 and double continental champion in madison (2015 and 2016), forming a duo with Albert Torres. This season, both got the silver medal in the World Championship of Apeldoorn; while Mora added two new national titles (persecution and madison) to his extensive list of Spanish Championships. 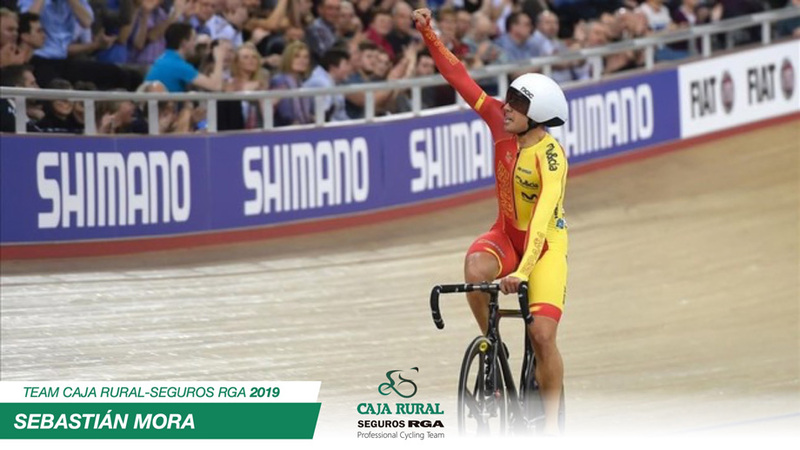 His main function in Caja Rural - Seguros RGA will be help and protect the sprinters of the Navarre squad, who will found in Mora a powerful help in the final meters. It is the eighth and last addition of the season after the announcements of Matteo Malucelli, Jon Aberasturi, Alan Banaszek, Domingos Gonçalves, Sergei Chernetskii and the young Xavi Cañellas and David González. Sebastián Mora: "This is a great and new experience for me, it is a leading Spanish team, something that I have been looking for a long time and that has finally arrived. It will be my first season in the Professional-Continental category. Above all, I hope to contribute with my work as a launcher for the sprinters, since it is the function that I can best play thanks to the work I have been doing on the track. I arrive very motivated for the next season. I hope to do the best job possible. If the team is happy with it, I will be too." Aberasturi, Jon (Álava, 28/03/1989) – 1st season (Euskadi-Murias). Amézqueta, Julen (Navarra, 12/08/1993) – 2nd season. Aranburu, Álex (Guipúzcoa, 19/09/1995) – 3rd season. Banaszek, Alan (Polonia, 30/10/1997) – 1st season (CCC Sprandi Polkowice). Cañellas, Xavier (Illes Balears, 16/03/1997) – 1st season (Feeder team). Chernetskii, Sergei (Rusia, 09/04/1990) – 1st season (Astana). Cuadros, Álvaro (Granada, 12/04/1995) – 2n season. Gonçalves, Domingos (Portugal, 13/02/1989) – 2nd season (Radio Popular-Boavista). González, David (Ávila, 21/02/1996) – 1st season (Feeder team). Irisarri, Jon (Guipúzcoa, 09/11/1995) – 3rd season. Lastra, Jonathan (Vizcaya, 03/06/1993) – 4th season. Malucelli, Matteo (Italia, 20/10/1993) – 1st season (Androni Giocattoli – Sidermec). Molina, Antonio (Alicante, 04/01/1991) – 6th season. Mora, Sebastián (Castellón, 19/02/1988) – 1st season (Track). Moreira, Mauricio (Uruguay, 18/07/1995) – 2nd season. Pardilla, Sergio (Ciudad Real, 16/01/1984) – 5th season. Rodríguez, Cristian (Almería, 03/03/1995) – 2nd season. Serrano, Gonzalo (Madrid, 17/04/1994) – 2nd season. Soto, Nelson (Colombia, 19/06/1994) – 2nd season. The Spanish Euskadi-Murias team has signed twenty riders for 2019. The Basque ProContinental team has lost a few important riders from 2018, but also managed to attract Beñat Intxausti. Whether Intxausti can return to his best is not certain, since the 32-year-old climber has been struggling with the aftermath of Pfeiffer's disease for three seasons. He had only 23 race days since January 2016 for Team Sky and this year only 5 race days. Euskadi-Murias hopes that the Basque rider will return to his former fitness in his home team. Urko Berrade, Mario González, Juan Antonio López-Cózar and Daniel Viejo have also joined for next year. The team recently lost Jon Aberasturi and Eduard Prades to Caja Rural-Seguros RGA and Movistar. Aberasturi won a stage in the Vuelta a Aragon and took a few podium places. Prades gave the team the biggest victories, with final wins in the Tour of Norway and the Presidential Cycling Tour of Turkey. He also finished second in the Tour de Yorkshire. For 2019, Euskadi-Murias will be hoping that Óscar Rodríguez can repeat his stage win in the Vuelta a España at La Camperona. "Euskadi-Murias is a project with a future. Hopefully we can say in four years time that we won a stage in the Tour de France," said team manager Jon Odriozola after Rodríguez won. The 23-year-old Spaniard has to become the figurehead of the team in recent years. It is also looking forward to the climbers, Fernando Barceló, Mikel Bizkarra and sprinter Enrique Sanz, who will get more freedom after the departure of Aberasturi and Prades. Mikel Aristi, Aritz Bagüés, Fernando Barceló, Other Barrenetxea, Cyril Barthe (Fra), Urko Berrade, Mikel Bizkarra, Garikoitz Bravo, Mario González, Beñat Intxausti, Julen Irizar, Mikel Iturria, Juan Antonio López-Cózar, Óscar Rodríguez, Sergio Rodríguez, Héctor Sáez, Sergio Samitier, Enrique Sanz, Gotzon Udondo, Daniel Viejo. The American Hagens Berman Axeon team has finalized its rider line-up for 2019. The ProContinental team has attracted a sixth new rider, American Liam Holowesko at the last. Hagens Berman Axeon has been known for years as a talent factory, which team manager Axel Merckx showed again this year. The American team has managed to train no less than five riders for the WorldTour; Sean Bennett (EF Education First-Drapac), Will Barta (CCC), Rui and Ivo Oliveira and Jasper Philipsen (UAE Team Emirates). The team has signed a total of six new riders for 2019. Besides Holowesko, Karel Vacek, Jakob Egholm, Sean Quinn, Kevin Vermaerke and André Carvalho will be lining up in the 16 man team in the new season. The team hopes to prepare more riders for the WorldTour in 2019. This is certainly not unrealistic, as it has some top talents in Mikkel Bjerg, João Almeida and Karel Vacek. In addition, the team can count on American champion Jonny Brown and the Dutchman Maikel Zijlaard. João Almeida (Por), Edward Anderson (US), Mikkel Bjerg (Den), Christopher Blevins (US), Jonny Brown (US), André Carvalho (Por), Cole Davis (US), Jakob Egholm (Den), Ian Garrison (US), Liam Holowesko (US), Zeke Mostov (US), Sean Quinn (US), Thomas Revard (US), Karel Vacek (CZ), Kevin Vermaerke (US), Maikel Zijlaard (Ned). 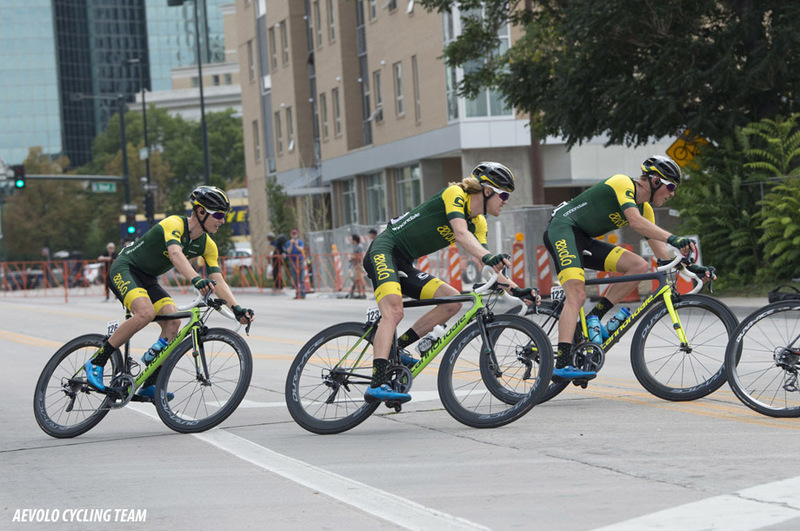 Coming off a highly successful second year, Aevolo has finalized its 12-rider roster for the 2019 season. Eight riders have re-signed, and four riders will wear the green and gold Aevolo colors for the first time. Joining Aevolo for the upcoming season are collegiate track national omnium champion, Cade Bickmore; 2017 and 2018 Tour de L’Abitibi winner, Riley Sheehan, Ronde des Vallées victor Andrew Vollmer, and Costa Rican climbing phenom, Gabriel Rojas. Among the returning riders is powerhouse Gage Hecht, whose win at Colorado Classic and national U23 titles in the time trial and criterium prove the Colorado all-rounder keeps getting stronger. Also with a U23 national title to his name, Alex Hoehn will continues in 2019. Mexican time trial champion, Luis Villalobos, will race with Aevolo for the half the season before transferring to EF Education First. A strong climber and selfless teammate, Fernando Islas, stays with the team and Michael Hernandez, Lance Haidet, Tyler Stites and Laurent Gervais round out a tight, cohesive young squad. Cade Bickmore (USA), Fernando Islas (MEX), Alex Hoehn (USA), Riley Sheehan (USA), Luis Villalobos (MEX), Michael Hernandez (USA), Laurent Gervais (CAN), Andrew Vollmer (USA), Lance Haidet (USA), Tyler Stites (USA), Gage Hecht (USA), Gabriel Rojas (CRI). Next year the Roompot-Charles team will races on Factor bikes. The new Roompot-Charles team is a merger of Roompot-Dutch Lottery and Veranda's Willems-Crélan. Roompot-Dutch Lottery team have been racing on Isaac bikes in recent seasons, but it was announced that the collaboration would end. Veranda's Willems-Crélan rode Stevens in 2018, but the new merger team will race next season on Factor. AG2R-La Mondiale had been on Factor, but will be on Eddy Merckx bikes in 2019. Team Dimension Data for Qhubeka is delighted to announced a number of significant appointments in our high performance operations ahead of the 2019 season. Firstly, we are pleased to confirm that highly experienced sports director Hendrik Redant has joined our team from United Healthcare. The former Belgian professional enjoyed a successful 20-year career, which included a double triumph of Kuurne-Brussels-Kuurne, before moving into a sports director role. Interestingly, Redant's association with South Africa spans as far back as 1992 when he won a stage of the Boland Bank Tour. In other significant news, Dr. Daniel Green takes up the role of Performance Innovation Manager and Head Coach. Green spent 10 years at the Australian Institute of Sport and completed PhD's in Muscle Physiology and Performance Physiology and so brings a wealth of experience and knowledge to our team. Dr Green has already applied his expertise at a World Tour level with BMC Racing Team and Trek-Segafredo, so his addition is a coup. Portuguese rider André Cardoso has been suspended for four years by the UCI for violating the doping rules. Cardoso tested positive for EPO in June 2017 in an out-of-competition check when he was riding for the Trek-Segafredo team. Cardoso has already been suspended for more than a year. The B-sample confirmed the original analysis. In July Cardoso said he did not have enough money to enter into the legal battle. The suspension is retroactive, which means that Cardoso is suspended until June 26th, 2021.